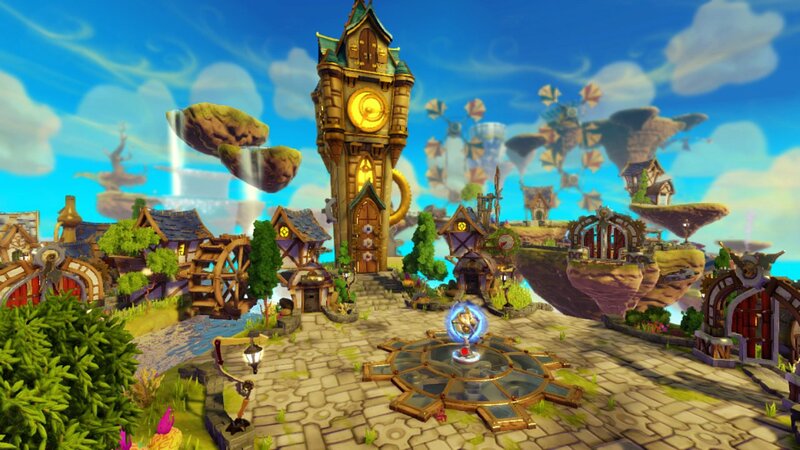 If you have someone missed the news, we have an exciting development in the Skylanders SWAP Force world. A new Adventure Pack and Battle Pack are up for pre-order at most all retailers! You'll find a few screen shots of each, my thoughts on them, and most importantly, links to a few retailer where you can place your pre-order! 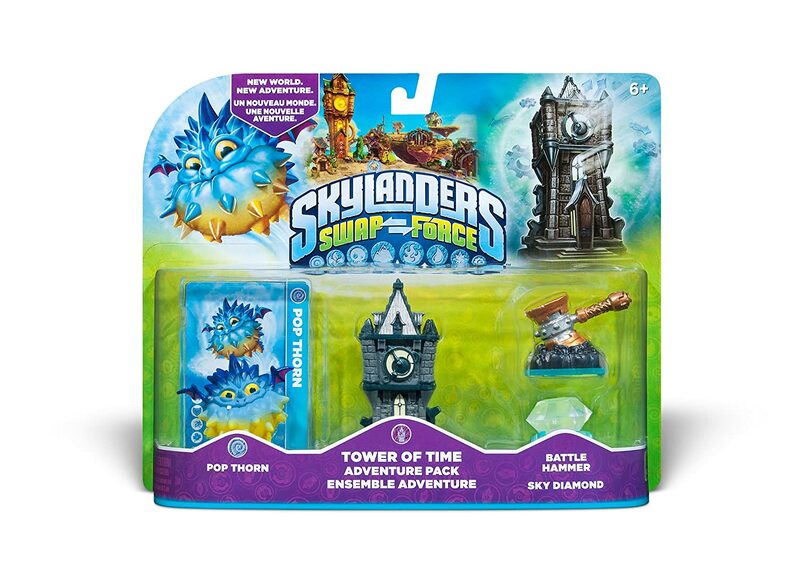 The Adventure Pack is the Tower of Time which I revealed to you long ago when I got the official Skylander Day Flyer at GameStop a few days early (Click here: http://www.1ofwiisdom.com/2013/06/skylanders-day-at-gamestop-saturday.html). As I had predicted, Pop Thorn was the final name, not Gasteroid as many suspected following a leak. The tell-tale sign was the poster which featured the box art. 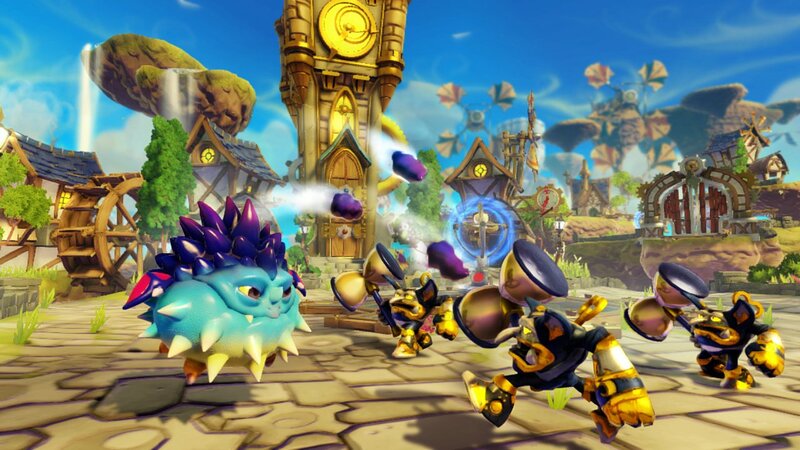 The AP will feature Pop Thorn, a new Skylander hailing from the Air Element. 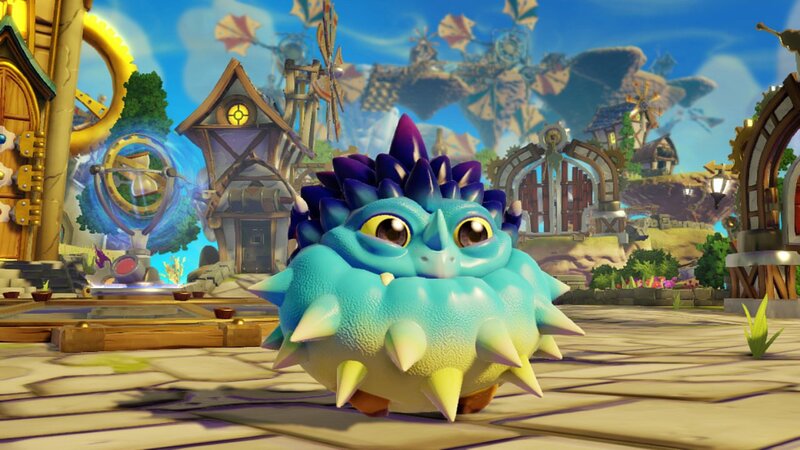 As I've stated since E3, he looks a lot like a cross between Woobat from Pokemon and Wrecking Ball from Skylanders. 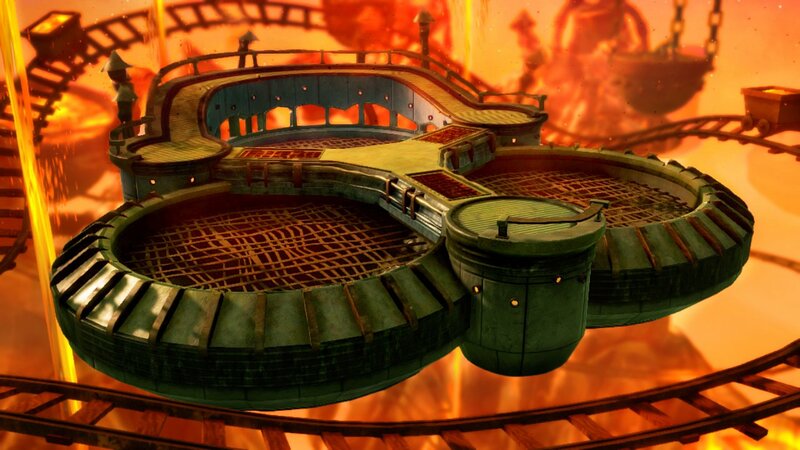 The location piece will be the Tower of Time...which looks killer. The screen shots below not only look great with Vicarious Visions new graphics, but the piece itself looks highly detailed! Wrapping up the adventure pack, in true throwback fashion, are two magic items. We have the Battle Hammer and the Sky Diamond. I personally hope that the Battle Hammer is akin to the Anvil Rain piece from Empire of Ice and that the Sky Diamond might just rain down diamonds...a cool take on the Treasure Chest from Pirate Seas. The Battle Pack was revealed in a recent leak and looks to be a good one. The official name will be Fiery Forge. The arena looks great, and very expansive. I am curious to see if the upward ramp is accessible...if so, a lot of strategy could come into play here. This one also looks like there will be no shortage of potential arena hazards! 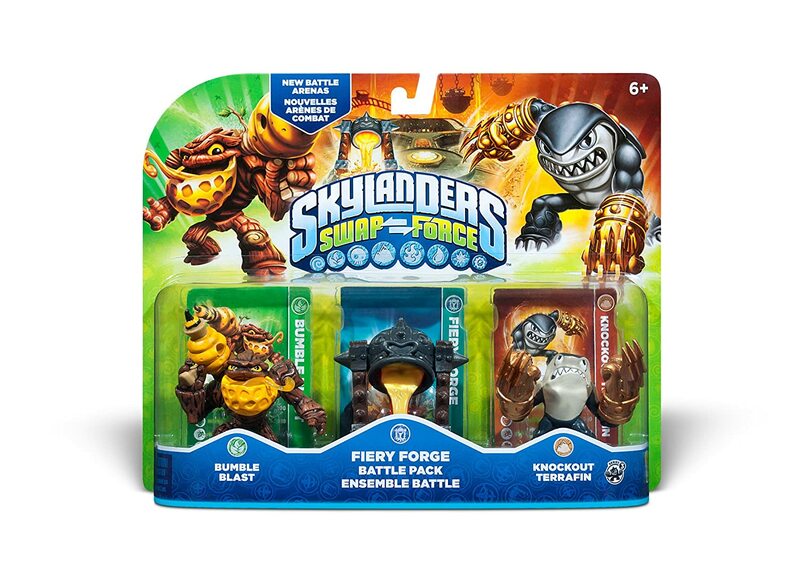 In addition to the Fiery Forge (which will unlock the Battle Arena AND likely serve as a damage tool in live gameplay), we get two characters, just like we saw in the Skylanders Giants Battle Packs. This time, we have Life vs Earth. 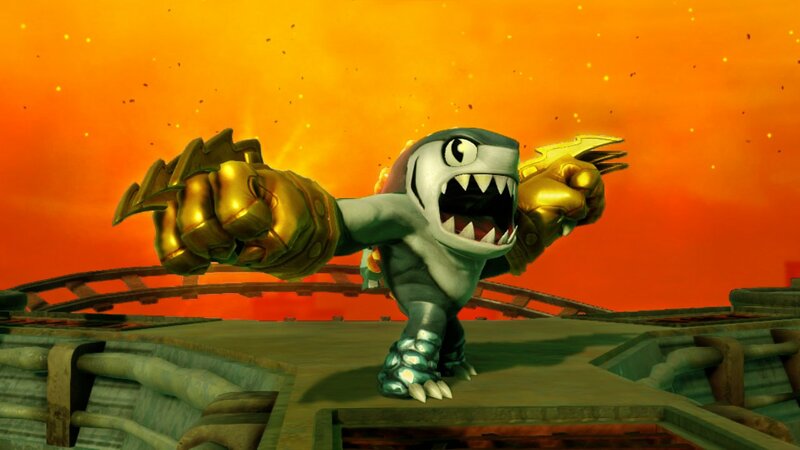 The brand new Bumble Blast, a Series 1 Life Element Skylander will face off against Series 3 Terrafin, who we can now, officially dub Knockout Terrafin! This is really my first look at a well lit Terrafin. At E3, he was in the first display case at the Skylanders SWAP Fore booth, but was hard to see the detail on thanks to the lighting. Seeing him in the screen shot and packaging he looks great..I am stoked to see Terrafin back and evolved into his Knockout state! The best news about these pre-orders is that we can pre-order them AND we thus know they will be available at lauch! When speaking to Guha and Karthik at E3, they both confirmed, to the best of their knowledge, we would have 2 Adventure Packs and 2 Battle Packs. I would bank on us seeing the remaining packs before Christmas...although, one could possibly hold out until the Spring. 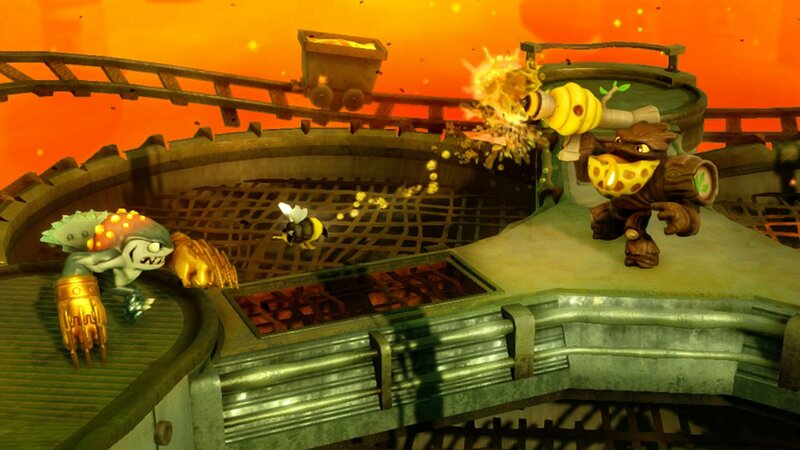 It is interesting we have not seen much of Bumble Blast in any gameplay. I find him to remind me an awful lot of what you would get if Zook and Stump Smash were combined at the ordering of Swarm. 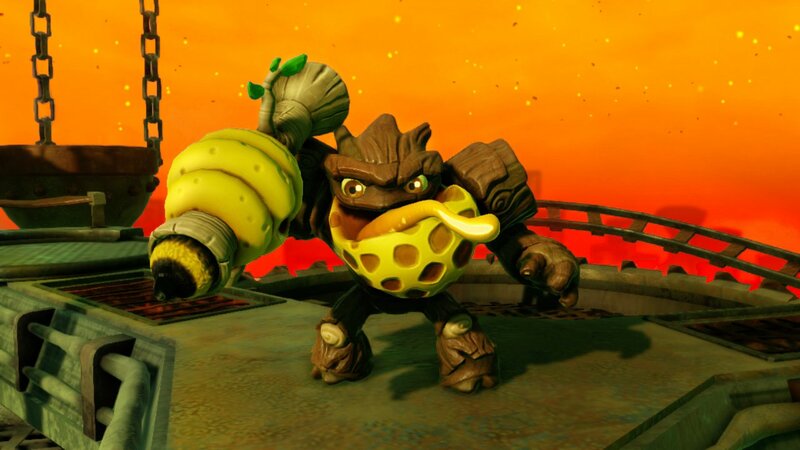 The blaster gun looks eerily similar to Zook's bazooka and his appearance clearly draws from both Stump Smash and Tree Rex. The honeycomb looking lower jaw draws comparison to Swarm. It looks like he is able to shoot Bees from the gun and his tongue looks too detailed in the box art to not play a role in something...It will be interesting to see how it pans out! Im probably more excited about the adventure pack cos we haven't seen them in a while. I'm not really happy about the 12 larger levels (they say same amount of gameplay) but that means large levels and some people might not have time to play large levels. Likewise...I much prefer the Adventure Packs. 1 Character, new content in terms of a playable level, and 2 Magic Items is easily superior to 2 characters (which likely won't be exclusive to the BP), a battle arena, or reskin, and the damage it inflicts in gameplay. Until Battle Mode has a Single Player option, or online play (imo you do Single Player first), it really doesn't mean much to me as I almost always play solo. Adventure packs are far more bang for the buck, but the BPs aren't horrible if you actually have someone to play with. I would also like to see a longer campaign. I feel like the ideal solution is a stand alone battle game, maybe at a low price point of $29.99 in the even they can't build it in to account for future releases...make it have 1P and Online. Then put the extra development into extending the core gameplay in the annual release etc. The lack of a single player battle mode is pretty sad...mainly because I would love to play it, and I'd play it often. If this is like the two previous game releases (Spyro and Giants) availabilty will be plentiful until Christmas when all the kids (mine included) get Swap Force. Unless it's a special variant or limited release, I'm leaning towards a Black Friday Sale price and won't be pre-ordering. That is correct. Launch Day for Giants was great with plenty of stock. It really is just right before Thanksgiving that things start to diminish...mainly bc a few folks start Christmas shopping, or fear they may miss out on the big sales etc. Having the 3DS kind of allows me to pre-order to ensure LC Hex, but past that I'm a bit leery that something better may pop up etc. As you stated, stock should be fine on launch and for most items up until the holiday rush. The only issue comes with the W2 releases as they can get plucked up on initial release, and then suffer the same fate with the holiday surge.